We at Schrock Innovations are please we were able to donate to the Notre Dame Sisters silent auction. Below is the transcript of the letter. 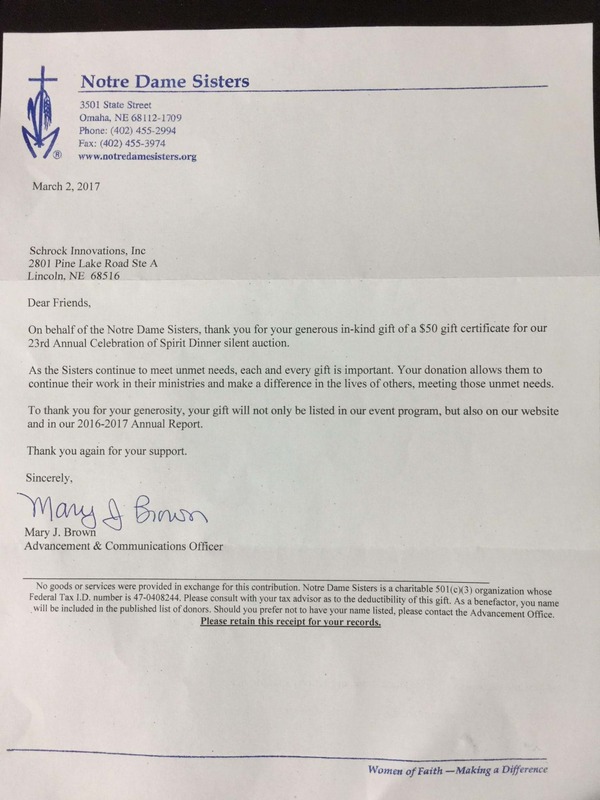 On behalf of the Notre Dame Sisters, thank you for your generous in-kind gift of a $50 gift certificate for our 23rd Annual Celebration of Spirit Dinner silent auction. As the Sisters continue to meet unmet needs, each and every gift is important. Your donation allows them to continue their work in their ministries and make a difference in the lives of others, meeting those unmet needs. To thank you for your generosity, your gift will not only be listed in our event program, but also on our website and in our 2016-2017 Annual Report.